In Se te va la costumbre, one of her early compositions and the opening song of her 2015 album, La media cuadra inmortal, for instance, she talks about how people are getting used to being oppressed without realizing it. The song is basically a reflection of her own observations during the military dictatorship in Argentina when superficially life seemed to remain the same while political oppression and injustice destroyed the country and its people’s lives with Nazi-like methods. The song was written more than three decades ago, but ever since she has continued to address political issues in her tango music. Listen for example to one of her latest compositions, Alberto, in which she tackles yet another controversial topic. The song is dedicated to Alberto Nisman, the Argentinian federal prosecutor who was killed in January 2015 while investigating the bombing case of the Asociación Mutual Israelita Argentina, the equivalent of the Jewish Federation in the US and umbrella organization of all the Jewish institutions in Argentina, back in 1994. The topic is highly controversial not just in Argentina. Simcovich dedicated her piece only later to Nisman, when she realized it was really about him, and then added the lyrics. 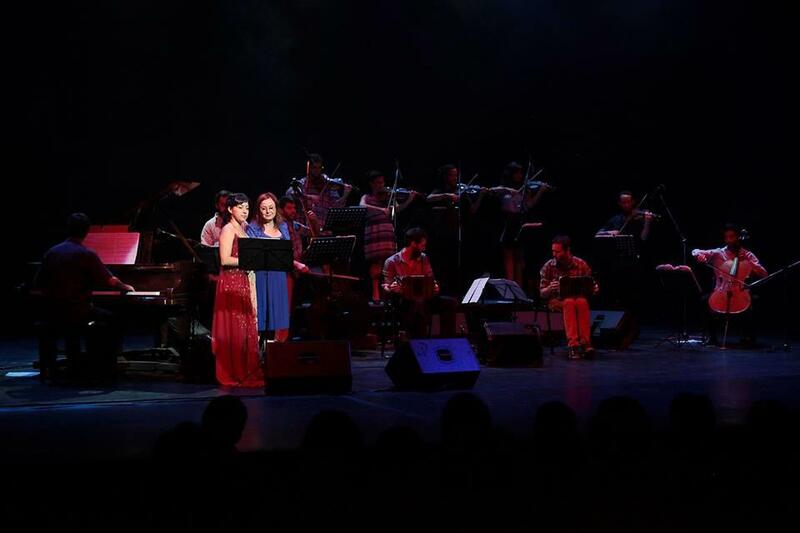 Her musical composition was praised by its own merits by Orquesta Victoria, who recently recorded Alberto at a studio in Buenos Aires as part of Simcovich’s new album, El Mundo is the World. They felt it was a very powerful composition which stands by itself musically and conveys the tragedy that inspired it – so powerful that the musicians even preferred to leave out the lyrics. The tango with the lyrics, however, will be performed during the upcoming tour in November in the United States on a promotional tour for the album. Aside from ten of her original compositions, the new album also contains two classics from the 1930es which Simcovich completely recreated; she even translated the lyrics into English. This will be the second time that Orquesta Victoria releases an album with tango music written by Débora Simcovich. 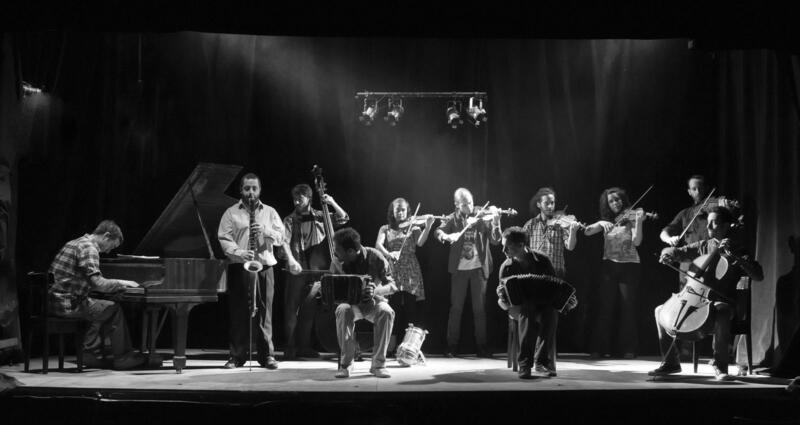 This group of twelve young, energetic, and classically trained musicians seems to have a magical connection with the Buenos Aires-born composer. She discovered the orchestra by chance one night a few years ago when helping a stranger to find her way on a visit to her native city. “There I stood suddenly,” she recalls, “listening to these young people playing tango! They were the same age that I was when I had to leave Argentina. And now they could play the music that at the time we didn’t play because people my age just were not interested in it.” It was an emotional moment for her. But even deeper connections came to light during the following days: The orchestra’s leader, Ezequiel “Cheche” Ordoñez, turned out to be the nephew of one of Simcovich’s childhood friends — a daughter of celebrated chess grandmaster Miguel Najdorf. As a child, Débora frequently went to the Najdorf house to do her homework and to play with both daughters. On these occasions her father would see the famous chess player. Both men shared the same roots: both were Jewish and both had left their Polish home country. In doing so, Débora Simcovich faces several major issues: Firstly, she is a female composer in a macho world where women traditionally don’t have a voice; they are being talked about, sung about, and they are the subject of almost every song in Argentine tango. Women dance and sing tango, but women, at least in the early days, did not write tango — and this stigma still prevails. Secondly, Simcovich is a Jewish woman in a society where anti-Semitism is still widely predominant (see the above-mentioned bombing of the AMIA), which is quite bizarre especially in the world of tango where many of the early tango musicians were Jewish immigrants from Eastern Europe. They had received their classical musical training in countries like Russia and Poland and had a great influence on the tango music of their new home country, Argentina. And finally: “People want to listen to the music that they already know,” says Simcovich. Meaning that people are not really open to new forms of Argentine tango, such as her own compositions. Still, that doesn’t stop her from doing what she feels is her responsibility as an artist. She recalls her humble beginnings as a ‘cultural ambassador’ of Argentina, touring US colleges and universities with her own tango compositions. She had saved about fifty pieces of her own work and took them with her when she left Argentina hastily on a military plane, two weeks before the military officially took over. The bizarre story of her narrow escape was a result of yet another intuitive action of hers: she had claimed to be the niece of a high-ranking officer with a mission to tour Latin America with her tango compositions. It worked. They flew her to El Salvador the following day and she gave her first concert at the Argentinian Embassy. Then she indeed was on a tango tour through several countries, sponsored by university and other cultural programs, and eventually ended up in the United States. But she soon got bored and felt misunderstood by her audiences: “People outside Argentina didn’t really understand tango,” she says. She stopped and turned towards a different career. But when, a few years later, she was asked to perform one of her songs with Dr. Loco* at a Peña, a gathering of musicians in San Francisco’s Mission District, she received such an overwhelming response that she knew: “People need it and you have to give it to them! Their lives are enhanced by my music!” It may not be as much for dancing as some of the songs of the Golden Age, but it’s certainly great tango. *Dr. Loco’s Rockin’ Jalapeno Band is a local San Francisco band whose mission is to keep Chicano music alive.